My first office wear of the year, as I'm now back at work! I've returned earlier than planned, partly due to getting a place at our ideal child care centre a little sooner than needed. When a place comes up, you take it! Some people are on waiting lists for day care before their babies are even born. In Australia, you are legally entitled to 12 months maternity leave, and my company allows 2 years. I'd thought a lot about what I should wear for my first day back - and figured overdressing was the best way to go. 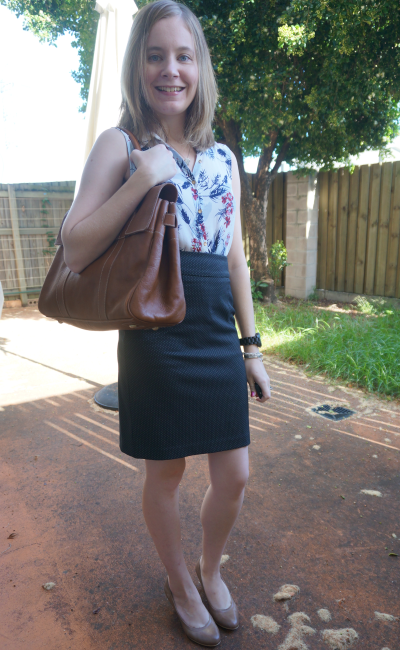 So collared button up shirt (but sleeveless with no blazer because it's Queensland and summer), pencil skirt, heels, and structured, formal bag. I've mentioned before that my workplace is business casual, with a lot of emphasis on the casual side of things. I felt suitably overdressed for tackling a mountain of emails! It was good to see people who I hadn't seen in a while, and there was a lot to catch up on. There was also a lot of technical issues to wrap my head around - lots of things to set-up and reactivate after being on extended leave. I think my biggest achievement of the day was not getting through all those emails, but managing not to cry when everyone asked how much I was missing baby T - I'd never spent so much time apart from him before. Last worn: floral shirt, polka dot pencil skirt, brown heels, Mulberry Bayswater tote. After wearing heels all day on my first day back, I needed to go back to flats again! My knee just isn't used to heels for an extended period of time. I've noticed being back at work that everyone seems to be sticking to business causal wear now. It was a really hot day (over 36 Celsius, 97 Fahrenheit) and I was expecting to be overdressed again. But I didn't see any denim! It wasn't out of place to see people in denim shorts in the office on hot days before I went on leave. The clothing guidelines were very flexible... I was pulled into an important meeting with just 30 minutes notice though so I wonder if that happens a lot and so people are always dressed to impress now, hehe. I even wondered if maybe the grey marle pencil skirt was too casual of a fabric at one point. I bought it a few months back thinking it would be perfect for the office, now I'm thinking it will just get worn on quieter days. A lesson to myself to stop buying things for the future, and just buy things that will get use now. I wore this cute dog print top as I've been looking at it in my wardrobe and wanting to wear it for a while - it's really good for work, not so much casual day-at-home-with-baby wear. You can't really layer a nursing tank underneath. It really is a candidate for leaving my wardrobe, as it's been worn so little. But there is a reason. When I first got this top, it had a little belt and belt loops stitched on it. That's limited the ways I could wear it. So based on something Sheila said on her blog a while back, I cut the belt loops off! Managed to do it without cutting into the shirt, I was very pleased it didn't all fall apart on me! Meant I could wear the shirt over the top of my skirt, without having to line the waistband up with the belt loops sticking out. Hopefully this blouse gets a lot more wear now, as 4 times in nearly 2 years wasn't a lot. While I am trying to downsize my wardrobe, if there is some minor change I can make that would mean something gets more wear, I'll give that a try first before I let it go. 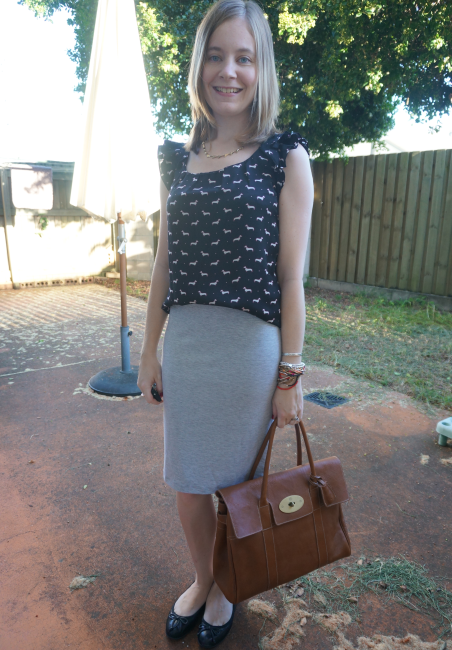 Last worn: dog print top, grey marle pencil skirt, black flats, Mulberry Bayswater (above). Linking up with What I Wore, Whatcha Wearing Wednesday, Get Your Pretty On, Because Shanna Said So, Style Me Wednesday, Trendy Wednesday, Oh, hey girl, What I Wore Wednesday, Style Me Weekly (and here and here), Spotlight Weekly, What I Wore to Work, Sydney Fashion Hunter, Fun Fashion Friday, Modest Monday today. You are so adorable Mica! Love your back to office outfits. I am always a big fan of your office wear style - So, glad to see you back to work!! Thanks! I'm still getting used to it - the hair cut and returning to work, haha! I like the second look! I don't think the skirt is too casual but, I do understand where you're coming from. The dog print top is really cute. I'm glad you didn't get rid of it! Hopefully you can wear it a bit more now. I looooove your Mulberry! They are amazing aren't they? Oh dear, people are so nosy aren't they? haha It is totally up to you on when you want to return to work or if you will return at all. & also a mother knows best! It is good to hear you got a spot open! My sister had to go back to work after she had a baby and she says it was one of the hardest things to do. Looking forward to seeing your work outfits. haha yes we get government pay and work place pay, and if you time it right like I failed to do, you can be paid a little for the entire year. But I screwed up filling out the forms so I got it all at once, ha! Hope you are enjoying the last few days of your maternity leave! 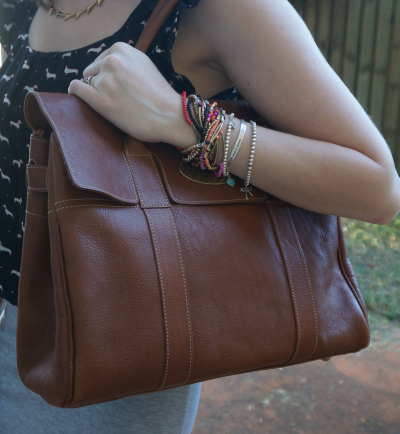 Love the Mulberry bag, such a classic! And yea, if you like to work, you should! And shouldn't let people make you feel weird for doing so. And awesome, I'll have to see if we have something like wool wash here! Haha. I would assume we do....we have so many dumb things, so why wouldn't we have a smart thing? Hope you can find something like wool wash, it's been great for my delicate knits! Your work looks are great! My favorite is the first one! Both of these are perfect!! Love them on you too. Whereas I'm totally jealous you get 12 months of leave, I totally understand you reasoning. Here you get 6 weeks. At 6 weeks I was not ready, I hated every moment of it. There were lots of tears and every day was a struggle. But as much as I constantly say I want to be a stay at home mom, I know the office is a healthy place for me. Being active, interacting with adults and keeping a schedule is great. Plus Baby T will have sooo much fun making new baby friends at day care. I think a lot of the questions from people you get are simply because that's near unheard of here in the US, and probably a few other countries too. I can only imagine how tough it was going back at 6 weeks - you're doing a great job! Aw, thanks for the shout-out, Mica! No one can tell you where you have to belt (if at all!)! Love the back to work outfits - our office is also looking at reining in the way-too-casual outfits lately. We're pretty casual here! I am always the dressiest people. You've been inspiring me a lot lately, it's good I'm using more of my wardrobe as a result! I love them both! I think you look incredible. Returning from maternity leave?! I would have never guessed that you had a child, you look amazing! I love both of these outfits! I really love the second one, that top is amazing! People are so dang nosy! Goodness, aren't y'all lucky to have such lovely, long maternity breaks?! What a blessing. You look wonderful in both looks. The dog print top is so fun! I really took note of your floral and pinstripes, as it is a look I haven't tried and it looks fab. Great office look! Very put together yet relax. You look incredible. I love the pretty prints on your tops. I hope your return to work is going smoothly. You look both professional and adorable! And I bet the little reunion with Baby T was amazing! I'm in love with the Mulberry bag. I can tell you are returning to the office in style! Great outfits to go back to work. I am a bit envious of the extended maternity leave that Australia allows. I only had 3 months but truth be told, I was ready to go back to work. My ideal world would be to work part time. Congrats on your return to work. I agree with you wholeheartedly on needing to do what's right for you and your family. I took the 12 months and I've been back just over a year now working 3 days a week with bubby in childcare for 2 of those days and Nanna taking the other day. It's what works for us but I have encountered a little bit of "why do you need to go back? Oh I could never put my kids in day care etc". I love your looks too. One of the main things I enjoyed about going back to work was getting dressed again! Definitely, it helps a lot. As an added bonus, my parents have just moved closer so I now have the option of Grandma for a day a week as well so if the opportunity to go four days a week arises, I can take it! Back to the work grind, eh? Good luck! Your outfits are not only pretty but professional for the workplace too, awesome! Especially like the floral print sleeveless shirt, it's perfect for Spring! Anyhow, I see you are already ready to go to work, both of those outfits are elegant and office-approved:) You have wonderful taste in clothes! Loving these office looks! Both of those skirts are so cute! Loving the new hair straight too! So pretty! Such a classy and stylish looks! I love them both! You have such a sense of style! I laughed out loud at the beginning of this post, because I literally signed my baby up for daycare (for when hes 4!) when he was a couple of days old! Love the outfit, you look amazing! Wow, back to work already! You're a true power woman! I think that going back to work after a month or a year is a mom's personal choice, you know when the baby and you are ready. Everyone has different timings. I am so impressed with the maternity leave there! We get a measly 12 weeks. Sad! I love the outfits, all look great for heading back to work! That is awesome that you can take up to two years leave! At my workplace, we can take up to 12 weeks. So happy for you that you found a daycare... That is no easy task! People seem to have so many opinions about motherhood and parenting. I think you just have to decide to do what's best for you. You look so great in a pencil skirt! Here in the States we only get 3 months! 1-2 years is absolutely amazing and AWESOME Mica! Yeah, everyone has an opinion. I hate that, because everyone's situation is totally different. It's always hard getting readjusted after an extended absence. But you handled it well and looked AMAZING! I have to agree with your thoughts on working. Every mom is different and every baby is different. You have to do what works best for you. The nice thing is you have the option of longer if you needed it. You certainly returned to work looking fab! I love the pretty floral blouse! you look so professional in both your outfits! i'm so envious of Australia's maternity leave policy! I am loving your hair Mica! Great back to work outfits and I hope it all went well!